Ottoman politician Tabaniyassi (“Flat-Footed”) Mehmed Pasha was executed by drowning on this date in 1637, having fallen foul of the tyrannous Sultan Murat IV. It hadn’t been long since Mehmed Pasha (English Wikipedia entry | Turkish) was the one inflicting the sultan’s chastisements instead of receiving them; he was appointed Grand Vizier in 1632 to crush a Janissary revolt* in Egypt, and did so with brutal aplomb. His career thereafter saw him carry Turkish arms to Persia and Armenia, and bully client princes in the Porte’s European sphere. Murat eventually grew suspicious that his aide might be conspiring against him and had him imprisoned at the capital’s imposing Yedikule Fortress. * The sultan had reason to fear these mercurial praetorians; he had the throne thanks to that same clique’s 1622 murder of a predecessor. 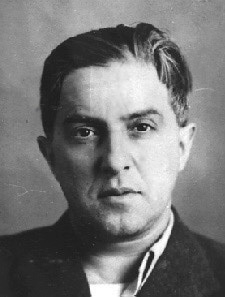 On this date in 1940, Soviet writer Mikhail Koltsov was shot at Lubyanka Prison. Maybe the premier journalist of the early Bolshevik state, Koltsov (English Wikipedia entry | Russian) founded several magazines in the 1920s — including the still-extant Ogoniok. * His stylistic flair set him apart in an age oppressed by leaden, censorious prose. “If Pravda featured a readable piece in the 1930s, Koltsov was probably the author,” Donald Rayfield puts it in Stalin and His Hangmen. And the man’s charisma didn’t end with pen; he was the lover of (among others) the wife of security chief Nikolai Yezhov. Be that as it may, Koltsov as Kremlin vizier to a dirty war was on the other end of the death warrant often enough; he also cultivated Ernest Hemingway, and was rewarded with a thinly veiled role in For Whom The Bell Tolls (the character Karkov). His memoir Spanish Diary is a sort of team-Soviet counterpart to Orwell’s Homage to Catalonia. Arrested as a Trotskyite at the end of 1938, he had a year to savor the terrors of interrogation and was made to denounce as western agents former friends like director Vsevolod Meyerhold — who was eventually executed on the same Feb. 1-2 night as Koltsov himself. His brother, the cartoonist Boris Yefimov,† tried to inquire about him in March 1940 and was told that Koltsov had been interned in the gulag for ten years “without right of correspondence” … a secret police euphemism for a man who would in fact never correspond with anyone again. * In 1923; this was a re-founding of a periodical dating to 1899, and the magazine naturally claims the earlier vintage for itself. ** Koltsov’s fall also corresponds to Moscow’s pre-World War II rapprochement with Berlin; one of the people his tortured denunciations helped bring down was the Jewish pro-western foreign minister Maxim Litvinov, for whom an anti-fascist alliance had been the policy. Litvinov was succeeded by Molotov — he of the Molotov-Ribbentrop non-aggression pact with Nazi Germany. † Their surname by birth was Fridlyand; their father was a Jewish cobbler in Kiev. 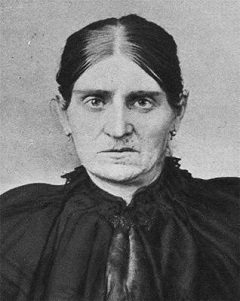 On this date in 1905, “baby farmer” Elisabeth Wiese was beheaded in Hamburg. In a luridly reported case “revolting in the extreme, proving the woman to be a monster of iniquity” Wiese stepped into a quintessential fin de siecle moral panic as a former convict whose larcenous past had forced her trade away from the legitimate field of midwifery towards the more shady precincts of mercenary fostering. When Wiese fell under suspicion, the neighbors’ reports of her kitchen glowing like hellfire and belching revolting stenches led police to the remains of these little ones burnt up in her stove. Condemned for five murders — it’s thought that the true count must have run much higher — Wiese is known as the “angel-maker of St. Pauli” after the suburb where she plied her trade. On this date in 1945, Carl Friedrich Goerdeler, godfather of the anti-Hitler resistance that had bid unsuccessfully for his assassination, was hanged at Plotzensee Prison. With him went fellow regime foes, Johannes Popitz and Father Alfred Delp. We should not attempt to minimize what has been happening, but we should also emphasize the great guilt of the Jews, who had invaded our public life in ways that lacked all customary restraint. A German patriot, then, committed to a “a purified Germany with a government of decent people”; a humanist Liberal from a bygone age, who had no weapons to fight a terror state. As Mayor of Leipzig, he openly opposed the Third Reich’s excesses and pushed to moderate its policy. * In 1937 he copped a principled resignation and started cultivating contacts abroad, warning of Hitler’s aggression — also managing to impress his foreign interlocutors with his incapacity to affect events himself. His many memoranda urging Hitler to moderate this or that outrage went for naught. The resistance circle around Goerdeler, which drew in his fellow-sufferer Popitz,** would be marked throughout the war years by that incapacity — a monument to high-minded failure, eternally short of the last ounce of will or that one key resource. 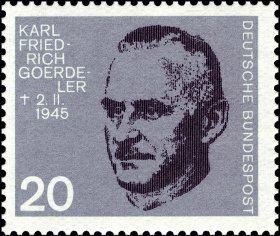 Goerdeler’s name adorned the ministry of many a fanciful post-Hitler government, but he himself, according to his friend and fellow-conspirator Gerhard Ritter, “preferred to begin with a debate rather than a power stroke”. To be sure, the man looked in vain for some decisive form of aid: within the Reich, the sympathetic Wehrmacht brass couldn’t quite see their way to something as radical as breaking their loyalty oaths; without, he got no terms short of unconditional surrender from the Allies. But even come the summer of 1944 when all was well past lost, Goerdeler entertained delusions of persuading Hitler to give up power voluntarily, and opposed Stauffenberg‘s assassination gambit. Indecision would be no defense when he was hailed before bloodthirsty judge Roland Freisler for treason. 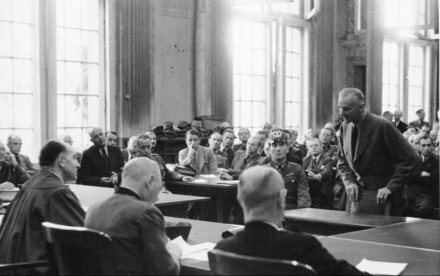 Goerdeler and Popitz, both viewed as influential with Germany’s Western enemies, were kept alive for months after the judicial purges commenced: Himmler‘s hope for a back channel deal. Our man had many hours in this Gethsemane for that essential contemplation of the 20th century. In sleepless nights I have asked myself whether a God exists who shares in the personal fate of men. It is becoming hard to believe it. For this God must for years now have allowed rivers of blood and suffering, mountains of horror and despair for mankind … He must have let millions of decent men die and suffer without moving a finger. We do not know what account Goerdeler gave of himself to the afterlife; even the account he left of himself for our terrestrial posterity is disputable. “I ask the world to accept our martyrdom as penance for the German people,” he wrote in prison. Is it enough to accept for Goerdeler himself? His actions, intrepid by the standards of most countrymen, were fatally unequal to the heroism demanded of his circumstance. By any measure, his is a very human tragedy. Carl Goerdeler’s brother Fritz shared the same fate a few weeks later. Other family members were imprisoned at Dachau; Carl’s son, Reinhard Goerdeler, became an accountant after the war and is the “G” in the big four firm KPMG. It would be too much to say that Berlin’s profligacy outraged him as much as the fact that it was being squandered on dishonorable war, but said profligacy was definitely on the bill of attainder. 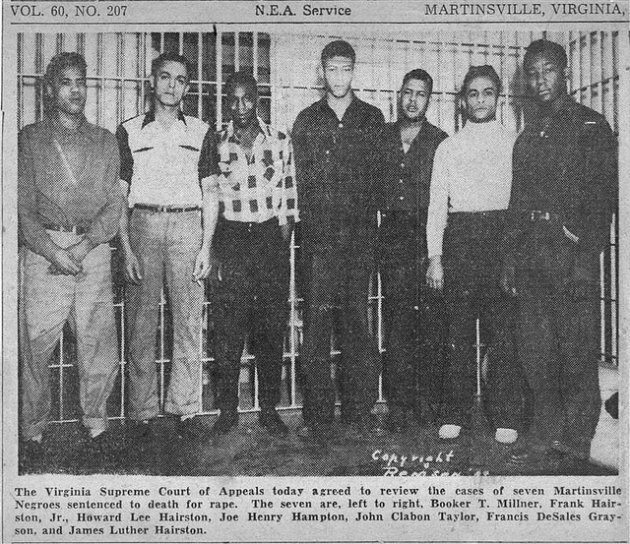 ** Father Delp, the other man hanged this date, was involved in the resistance but even Freisler’s court decided he wasn’t in on the July 20 plot. A Welsh courtier with the boldness to bed the queen lost his head this date in 1461 … but his career in usurpation was just getting started. 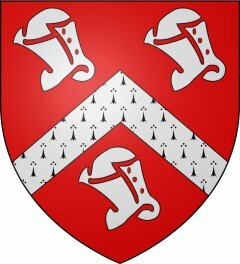 Owen Tudor’s coat of arms. The House of Tudor that would come to rule England counted Owen its sire; the four-year-old grandson he left at his death grew up to become the first Tudor monarch, Henry VII. Owen produced the root of this august line with Dowager Queen Catherine of Valois, the French princess Henry V had extracted as part of the price of peace after Agincourt. That union was supposed to join the two great realms, but Henry V unexpectedly kicked the bucket in 1422, leaving an infant son who was not only unable to hold the French throne … he was too unstable to hold the English throne, either. Unless he was a seer, suave Owen must not have been thinking dynasties when he took the Queen as his lover (and eventually his wife via a secret marriage in the early 1430s). They produced six children, but it wasn’t the bedroom politics that did our prolific father in, at least not directly. Only decades later, when ownership of the crown was up for grabs in the War of the Roses and Owen loyally led Lancastrian forces at a battle he was unwise enough to lose, did he give up his head for the pedestrian crime of backing the wrong horse. The head which used to lie in Queen Catherine’s lap, would now lie in the executioner’s basket. In time, Owen’s descendants would get to pull the same trick, because the doomed cause in whose service Owen Tudor lost his life swept clear England’s political chessboard and made possible his own line’s accession. Elizabethan poet Michael Drayton later versified Owen’s prodigious conquest in “Owen Tudor to Queen Catherine”. Is in excess of joy, I bad forgot. As still she doubts, if this be hers, or no. Where ev’ry letter’s pleasing, each word sweet. Before I e’er knew what it was to love. That you in marriage should be link’d to me. That kings and queens should follow in our line? Should with the golden flow’r-de-luce be drest ? Join Tether’s love to yours, and yours to Tether. Before our births, we to one bed were giv’n. None in revenge to kindle fire in Troy. That in our love we should be prosperous ? Was’t not my chance to light into your lap ? Sith he must fall, to fall in such a place ? By Theodor, the Tudors’ name do bring. As well from North-Wales, as fair Powsland’s seal. And why not Tudor, as Plantagenet? Which was at first begot with England’s shame. Subdu’d, have lost their country and their name. The only remnant of the Trojan blood. Not scorn’d by London, though of such renown. Were with my wish brought to desired end ! What eye durst stir, where awful Henry kept ? Where that all-conqu’ring great, Alcides lay ? And kings repair to cheapen merchandise. If to the fire, Jove once in light’ning came. Yet fear I Hermes coming in a sleep. When hope already banquets in excess. Never let queen trust Briton for my sake. Only to love is naturally mine. And be alike in all things fortunate. But yet (by Heav’n) he lov’d not more than I.
I cease to write, but never cease to love. Aficionados of old tyme history novelizations can also kick back with Owen Tudor: An Historical Romance. It is thought to be on this date in 1940 that the Soviet theater director Vsevolod Meyerhold was shot on a fabricated espionage charge. 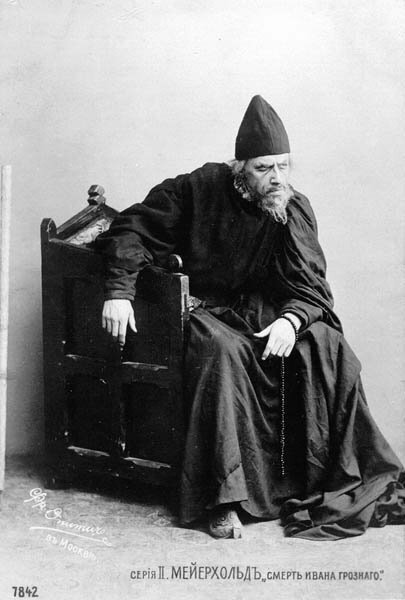 Meyerhold costumed as Ivan the Terrible. Meyerhold (English Wikipedia page | Russian) was one of Russia’s great theatrical innovators in the early 20th century. Pioneering non-representational theater — and a training method, “biomechanics”, to facilitate them — his star shone bright in the avant garde firmament of the early Bolshevik Republic. But Meyerhold’s schtick was most definitely not Uncle Joe’s fave, socialist realism. And that meant, come the 1930’s, Meyerhold had a problem. His career (Russian link) died out over that chill decade and the director himself was arrested in 1939 and tortured into confessing to spying. 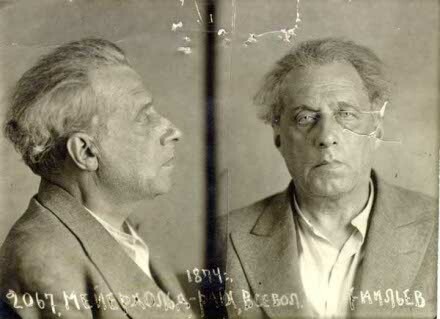 Meyerhold recanted the confession and sent Foreign Minister Molotov a pitiable appeal detailing his treatment. The director was officially rehabilitated in the post-Stalin thaw, but some of his work — like a collaboration with another artistic heretic, Prokofiev, on Boris Godunov — is only now being found and staged. Her body had 17 knife wounds, and her eyes had been cut out, apparently from the superstitious fear that they retained the image of her murderers. The only things taken from the apartment were documents.